To Make The Garlic-Shallot Butter: In a small saucepan, melt 1 tablespoon of the butter over medium-high heat. Add the shallots, garlic and thyme. Cook, stirring, until mixture is light brown. Add the salt, white pepper, wine and chicken soup base. Cook until the mixture is reduced to about 1/2 cup, stirring occasionally and adjusting the heat as necessary to prevent scorching. Remove the pan from the heat and quickly whisk in the remaining 3 tablespoons of butter. To Make The Pizza: Place a pizza stone in the center of the oven and preheat at 450 degrees F for at least 1/2 hour or more. Or you may bake the pizza on a baking sheet, but do not preheat the baking sheet. Sprinkle a pizza peel, clean work surface or baking sheet with cornmeal, semolina or flour to keep the crust or dough from sticking. Spread the garlic-shallot butter sauce to within 1/2 inch of the edges of each of the crusts. 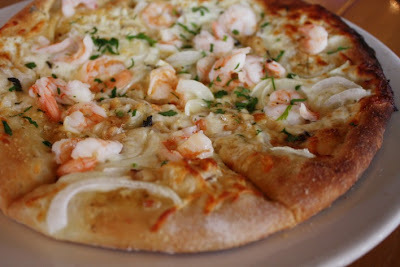 Then distribute the mozzarella, Parmesan, onions and shrimp halves, skin side up, dividing evenly between the two crusts. Transfer the pizza to the oven: Bake until the crust is crisp and golden and the cheese at the center is bubbly, about 10-12 minutes. The shrimp should be opaque and cooked through. Remove from the oven and garnish each pizza with a sprinkling of oregano and parsley. Slice and serve.